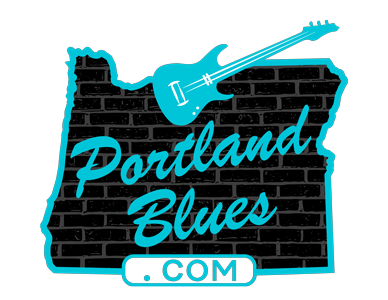 Who we are… The Cascade Blues Association is a 501(c)(3) non-profit organization dedicated to the preservation and promotion of blues and roots music in the Great Northwest. Have a question about how the CBA works, who’s on the Board, how you can join, or other important matters? The links on to the left should help you find what you’re looking for. 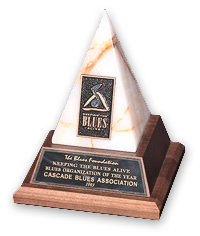 The Cascade Blues Association is the Proud Recipient of the Blues Foundation’s “Keeping The Blues Alive” Award for 2003! This award is presented to the blues society that has been the most active in the past year through its newsletter, educational efforts and community outreach programs. It’s the highest attainable honor for non-performers in the blues industry, created to recognize the behind-the-scenes professionals and fans who keep the Blues thriving and forging ahead. Friday prior to that if the 15th falls on a weekend. All submissions for the calendar, advertising and articles should be submitted by the 15th of the month or the Friday prior to that if the 15th falls on a weekend. No responsibility can be assumed for unsolicited materials or for items not submitted directly to the Editor or to the BluesNotes Editorial Offices. The entire contents of the BluesNotes is the property of the CBA and may not be reproduced in any manner, either in whole or in part, without written permission from the Editor. Open to the public the third Tuesday following the General Meeting at 6:30pm 2020 SE 7th Ave., Portland.